At a time of tumultuous change for the media, what is the role of local news in U.S. communities? Today, the Pew Research Center released a new report examining the local news environment in three U.S. metropolitan areas of different population size and demographic makeup: Denver, Macon, Ga., and Sioux City, Iowa. Here are five key takeaways based on the report, which incorporates data from surveys, analysis of media content, an audit of local news providers and social media analysis. 1Local news matters to local residents. About nine-in-ten residents in each city said they followed news about their local area at least somewhat closely, while about eight-in-ten said the same about neighborhood news. This is true in Denver, where researchers found 143 sources of news and information, but it’s also true in Macon, with 24 sources, and Sioux City, with 31 sources. 2Digital technology has impacted news habits in all three cities, but at different levels. More than half of residents in Sioux City and two-thirds in Macon and Denver access at least one news provider digitally, and roughly a quarter say they get at least some local news from social networking sites. 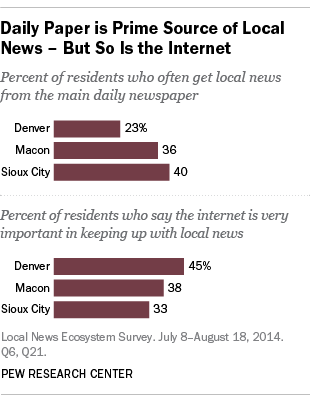 But within those numbers, residents of Denver are most likely to say the internet is very important to keeping up with local news (45%, compared with 38% in Macon and 33% in Sioux City), and news providers there make greater use of digital capabilities such as embedded links in news stories (31% of news stories in Denver contained these, versus fewer than 5% in Macon or Sioux City). Of these cities, it is Macon – the least prosperous but the one with the highest level of interest in local news – where residents are most likely to access a specific news provider on a social networking site. 3Residents are involved in the local news process, but in varying ways. Looking at who was cited as a source in news stories (excluding stories about traffic, weather and sports), in all three cities, the most commonly cited source in news stories was citizens. But an analysis of two weeks of content from the Facebook pages of local news providers reveals that users comment on only a minority of posts (32% in Macon, 31% in Sioux City and 43% in Denver), and comments to any one story tend to peter out within 24 hours. Still, for those citizens who are already very engaged with their city through participation in political or civic activities, the media is more vital. In addition to being more likely to follow a number of news topics, those who are very civically engaged in each of the three cities take part in a number of different news activities at higher rates than the less-engaged – ranging from sharing a news story digitally to calling into a live radio or TV show to submitting a letter to the editor. 4Race and ethnicity matters. Both Hispanics in Denver and blacks in Macon closely follow local and neighborhood news at higher rates than their white counterparts. In Denver, 60% of Hispanics (compared with 43% of whites) closely follow news about the local area. In Macon, that is true of 70% of blacks (compared with 43% of whites). Denver and Macon differ in at least one major way when it comes to news sources targeted toward these populations: Researchers identified nine outlets in Denver aimed at Hispanics and/or Spanish speakers. In Macon, researchers found just one that appeared to cater directly to the black community. 5Does a diverse set of media outlets lead to a diverse array of stories being covered, or do most news sources cover the same things? We found that media-rich Denver saw the greatest variety of stories covered by the newspaper and TV stations. The story that got the most attention from TV stations in Denver – 50 stories in all – was the disappearance of a 19-year-old woman from a Denver suburb. But the local daily paper, The Denver Post, ran just two stories on the subject. In fact, one of the top Denver TV stories – the skiing injury sustained by swimmer Amy Van Dyken-Rouen – was also a top story in the Post. That was not the case in Macon or Sioux City, where most of the top TV stories were also the top stories in the local paper. Sioux City, however, did have an exceptional week of news, with flooding in the area dominating the coverage.